Want to see what a SeedBoard can do? Check this post! 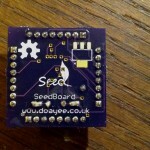 Note: SeedBoards are currently not for sale, but if you really want one drop me an e-mail and I will get in contact! So big(ish) news guys! 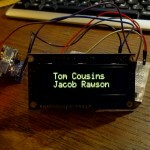 Me and my co-partner Jacob Rawson have been developing a small micro-controller dev board in our spare time, because we got sick of having to spend loads of money on an Arduino simply to embed it in a project and never see it again. 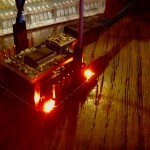 Now, there are other solutions to this rather than building your own, though much less fun, like the Sparkfun Pro Mini (which I have mentioned before)! For most of you this will be perfectly adequate but for me, living in the UK, it was just a tad too expensive to ship over here. So why not build one? I got myself onto EagleCAD and started designing a board! This is the result! 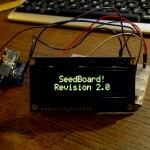 The SeedBoard (currently rev.2). With a small square form factor it’s ideal for embedding in a project, and (obviously) cheap enough! Costing us around £6 (~$10) non-profit. It can have any crystal you want in it, up to the chip limit of 20MHz, although if you’re feeling adventurous, you could try over-clocking it? 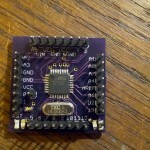 Thanks go to OSHPark for the amazing quality boards they consistently produce, this being one of them! They are currently not for sale, but (as mentioned above) if you really want one, drop me an e-mail (tom@doayee.co.uk) and I’m sure we can work something out! For those who don’t want one just yet though, we may be running a kickstarter sometime next year! ← Blutooth Audio Link – Video! Nice work. 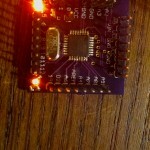 I’ve been looking at embedding arduinos in projects by building the circuit directly in. However I couldn’t justify the additional time and complexity when pro mini clones are available on ebay for £5.30 inc shipping from UK!